When I was younger for years I only ate a red sauce and mostly spaghetti. Spaghetti and meatballs every Sunday with sausage and brasiole on the side. I was so spoiled, like my grandfather, that if my grandmother cooked any other noodle, usually riggatoni I would not eat it, and she would still have to make me spaghetti. Now while I was not one of those kids who ate mac and cheese or pasta with butter, to me, if it was not spaghetti with a red sauce, it was not pasta. Fast forward to when I was in college. I was around 22 and still had never eaten anything but a red sauce with my pasta. I was sitting at a restaurant with my sister and she had ordered fettucine alfredo with chicken and broccoli. I was not eating and she asked if I wanted to try hers. I told her I was not going to eat that crap. But, as time wore on I was getting hungry so I dabbled into her leftovers. I was SHOCKED. I could not believe that I had spent my whole life just eating spaghetti with a red sauce. This food revelation does not change how I feel about my grandmothers spaghetti and meatballs. It was the best, so much so, that when I would bring friends over for dinner, that is what I wanted her to cook for them as well, because it was truly the best. My friends all agreed. So now every time I could a pasta that is not the traditional spaghetti with red sauce, I think of my sisters fettucine alfredo, at Hemingway’s restaurant in Pittsburgh and how it changed my eating habits. Here is a little number that would make my sister proud, although it is not fettucine alfredo with chicken and broccoli. 1 cup of chopped spinach placed in same bowl as leafy part of scallions. In a large pot place your water and 2tbl of olive oil in it and bring to a boil. Then in a flat skillet or grill pan place 3 tbl of olive oil and heat on medium high heat. Place the onion slices face down and cook. When the one side has charred flip and repeat. By keeping the onion slices together yo will end up only charring the edges while the rest will be translucent. This adds great flavor and is also perfect for when you make home made salsa. 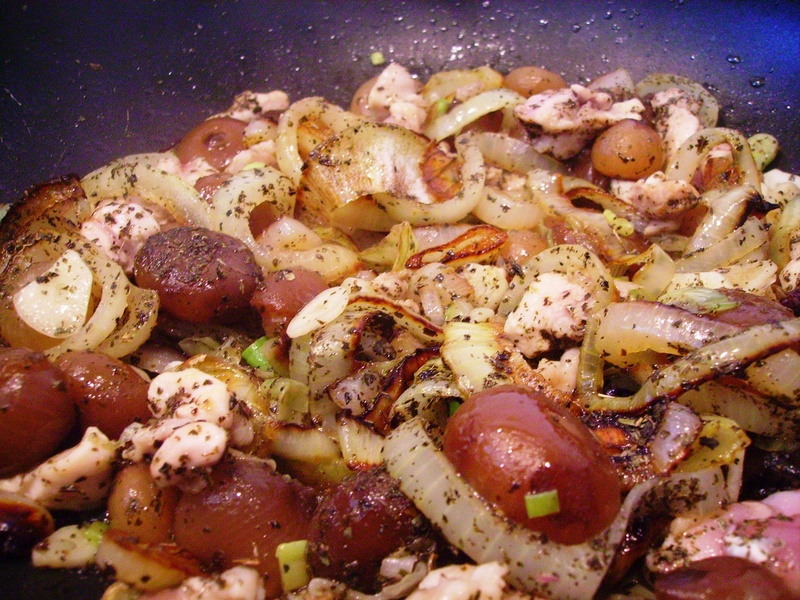 When the onions are blackened on their sides remove and place in separate bowl. 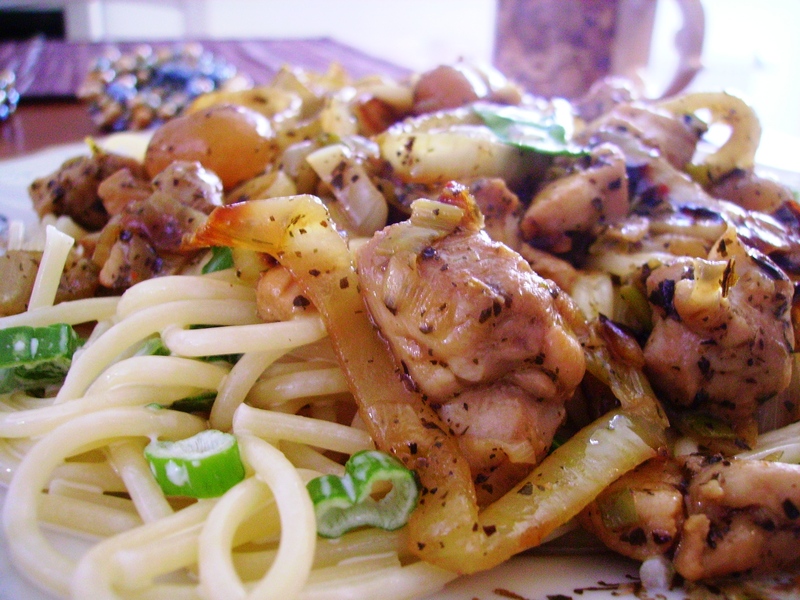 In a saute pan add your remaining olive oil, the meaty part of the scallions, garlic, chicken, and cipollini onions. (Before you place the cipollini onions in the pan be sure to rinse in warm water several times. While the red wine vinegar is a nice marinade for them and will give a great flavor, you do not want to be overpowered with any excessive vinegar.) Saute ingredients on medium high heat stirring occasionally. As the pan begins to dry out add a quarter of your chicken stock, the basil, and the charred onions. Continue to cook and once the pan begins to dry out add the rest of your chicken stock, stir scraping the bottom, and reduce in half. By now you should have placed your pasta in the pot and cooked it. Remove pasta from pot, and place in bowl. Put cheese sauce over pasta with spinach and leafy part of the scallions and toss thoroughly. Place pasta on a plate and top with ingredients from your suate pan. This entry was posted in Baby Spinach, Basil, Chicken Stock, Chicken Thighs, Cipollini Onions, Cooking, Cuisine, Dinner, Eating, Extra Virgin Olive Oil, Food, Garlic, Herbs & Spices, Italian, Italian Cuisine, Italy, Meat, Olive Oil, Onions, Pasta, Pecorino Romano, Recipes, Sauces & Marinades, Scallions, Spaghetti, Vegetables, Yellow Onions. Bookmark the permalink. At your present rate of consumption, they’ll be gone by the end of your next post. Fortunately, however, I can refer you to a good wholesaler. this dish looks so good. will have to try it! This dish looks great! I never really liked alfredo sauce when I was growing up either…I think it was too rich for me. I do make fettuccine alfredo for my husband now and I enjoy it. I can’t stand alfredo sauce on pizza though and I think alfredo sauce from a jar (at least the couple I’ve tried) is disgusting. By the way, you’re invited to my virtual dinner party: http://wp.me/p1hWXH-ng. Hope you can make it! Sometimes I think we’re long lost relatives! Uh oh, I hope I didn’t make you cry. This recipe looks stunning. I love that you’re using the chicken thighs lately. And the picture, oh my… sooooo good.